A dancer lies on the floor surrounded by a mandala of ordinary, yet luminously coloured objects from the life of a young person—tennis rackets, DVD sleeves. A female voiceover describes the aftermath of a suicide attempt, a moment when, against all odds, the body rejected a fatal cocktail of drugs. Her voice is followed by another, describing the accidental death of her brother, his organs donated. The prone dancer weeps openly as the remaining performers gently withdraw each mandala piece, stacking the bright fragments in small piles. This is 6000 to 1, a poignant and potent work by Stompin about choice and chance for young people. Drawn from local suicide statistics, the title, and the content, is close to the hearts of its dancers who are aged between 14 and 29. Chance also plays the audience. Gathering in a carpark adjacent to the venue, our tickets are playing cards. Those with red suits go in one direction, we, with the black, go another. We are told we will need to keep our card with us, that we will be asked to make choices. Throughout the work, staged within an appropriated gallery, the two audiences separate and merge, all of us standing in close proximity to the dancers for each scene. Each audience is introduced to two stories and a series of narrative fragments, illustrated through movement and voice: “this is not my personal story, but it comes from us.” In one, a girl steps into a pact with death, taking a mix of drugs and drink to end her life. In the other, a sister tells of a brother, horribly injured in a car accident. At the culmination of this first chapter, the two audiences merge and the dance builds in intensity. Initial movements based on joining, separating and re-forming between dancing pairs give way to faster bodily expressions of indecision, fear, tentative reaching, pushing and pulling, forward and back. 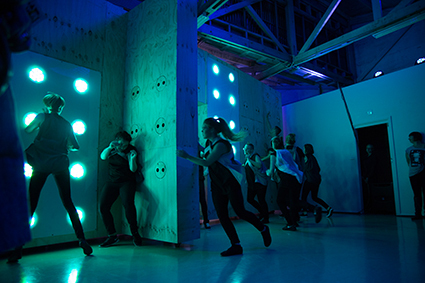 Again, the dancers’ voices expose us to story fragments: “I was launching myself into the unknown and it was one of the best decisions I’ve ever made.” At the narrative peak, movement is frantic, through and around a large, mobile prop wall, its illuminated patterning mimicking our playing cards. At this point we are asked, as an audience to choose. While we have been asked to show our cards prior within preceding chapters in order to interact (passively) with the dancers, strangely the playing cards do not figure in this last, more consequential choice. I go forward, rather than back. After a penultimate chapter within a darkened, enclosed room, where dancers voice views on fate and faith against repeated gestures and circular movement, we enter the last space and the emotional mandala scene plays out. A live video link connects the split audiences to aspects of the scene they are missing. I find that i have chosen to go forwards in time, toward the culmination of the story. A Q&A session with the company is the work’s postscript. While this is a debatable move that definitely diffuses the drama of final scenes, it is here that we learn that the narratives we’ve witnessed are true. We understand the way particular gestures formed around stories and why it is that a dancer would weep. While some of the nuances of this difficult subject area have been lost in the translation to performance, the work is undeniably affecting. The minimal yet intimate setting places the audience within the work, the split viewing format underscores the concept of chance and each scene is infused with the personal investment of the performers.